As a strange request from my cousin, she wanted a cube cake for a birthday party. 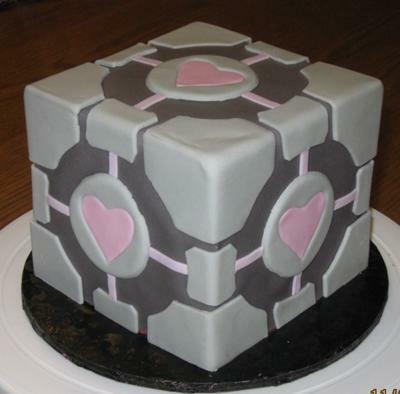 This cube is from a game that I never heard of, but she got me pictures, and I couldn't wait to try this cake out. About a week out, I was able to find a pattern on-line to help me out with the pieces that run along the sides and the corners. The corners were a little more tricky. But using copy paper and the pattern I got, I was able to make my own pattern to which would be the corners. After making my corner pieces out of fondant, I layed the corner piece on an extra 6" square cake pan I had to hold their shape while drying. **The bottom piece have only two side, unlike the top corner pieces that have three sides. ** Same goes for the side pieces. I layed them on the pan too, so they could dry. For the circle and heart's, I just used regular circle and heart cutters. In the circle I cut a heart out of the gray fondant, and then cut a pink heart out and added it into the gray fondant, and then lightly used my finger(s) to mend the two together, so they would stick together. CAKE-A square 6" cake pan was used, and 4 different cakes were baked. After stacking I made sure that it was going to be perfectly square on all side, measuring all the same lengths. After stacking, I iced all cakes in buttercream and covered cake in dark gray fondant. Then I added all the pre-made side and corner pieces. Using just a little bit of water, with a paint brush, I put a little bit of water inside the pieces that were going to stick the the corners and sides, to help them hold to the dark gray fondant. **DO NOT put a lot of water, if any to hold pieces. This is only if you need it to help hold them** I then centered the circles with the hearts in them on all sides, except bottom of cake, of course. Last I rolled some pink fondant out, and used my ruler to judge how wide the pink strips should be that run north, south, east and west of the circles with the hearts in them. That's a fantastic cake and so true to Portal! been over the moon about the cake. Very nice detail work,very clean lines, cute design.